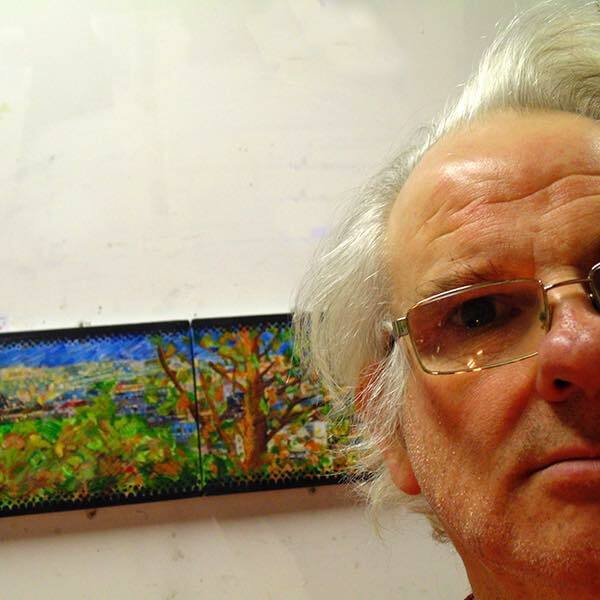 Pete Mountford is an artist who has been practising for over 20 years. He has exhibited in both the UK and USA. His work encompasses painting, drawing, digital imagery and other mixed media. Often underpinning this work is the appropriation of and relationship to existing systems; in the past this has including energy waves, the cycles of nature, maps and landscape. Rebel magazine came across Pete via Facebook and wanted to find out more about his "Seven into Six" exhibition currently on at The Well-being Art Centre 18 Western Road, Hove BN3 1AE until the 24th of April. Q: The roots of your "7 into 6" show go back a decade. Can you tell me how it all started? "The title "7 into 6" is for this particular show, and it was a chance to reconfigure the works in a different way by laying them in rows of colours, which gives off the mass colour hit that the ethos of the Well being gallery and health centre are about. When the works were made and exhibited originally between 2002-2005 they were grouped in sets of six with 5 of one base colour and a white panel. My mantra in those days (and something that still creeps in to my work occasionally now) is underpinning my work with 'system and chance'. In this case I played with associating colours to particular numbers to create a system and used a kids spin machine- using the same colours - to create the bottom half and give me a kind of controlled chance. The bottles are actually appropriated from Aura Soma colour therapy bottles, which my wife was starting to study and practice in at the time, and each had a specific number, a pair of colours and a set of philosophies to be interpreted from them, plus from my perspective they looked simply gorgeous and seeing them on mass was almost like crossing the repetition of Warhol with the spirituality of Rothko. There's a lot more to it then that, but my interest was not really about the meaning behind these bottles as such (although I don't mind if the viewer chooses to approach them this way) but more working with the existing system, combining it with another one, and seeing where that took me. However it is nice to see them again displayed this way." Q: The venue for your "7 into 6" show is the Health & Well Being Centre in Brighton - are they nice people to do business with? Is it a gallery space that you'd recommend? 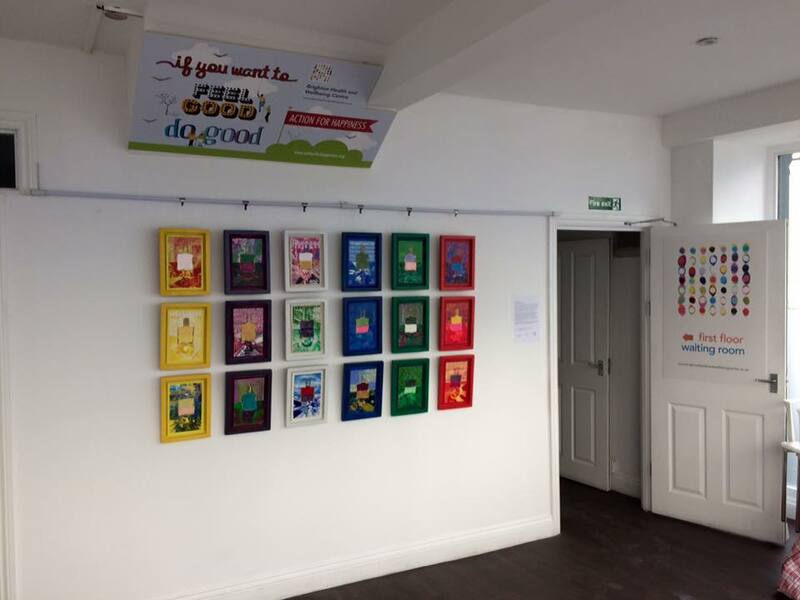 "The Well being Gallery is part of the doctors practice and its a place I've been a registered patient for the past 2 years since we moved to Hove. I noticed they displayed interesting art in the waiting room, made enquiries and hooked up with Jude Hart who curates the space and is a professional artist in this area (and a damn fine one in my opinion), who curates the space ( as well as co-ordinates one of the trails for the open house festival in May). The practice is renowned through Brighton & Hove as being very open towards holistic approaches and the Gallery's main driving objective within that is to "communicate to patients through the arts that self reflection and understanding personal narrative are at the heart of well being and good health" which is a pretty fine thing in my book. 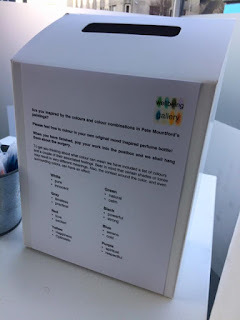 So its of course a gallery I would recommend, obviously work exhibited has to fit this broad ethos and normally there is an interactive project that goes on for the patients and other visitors to participate in. In this instance we have created templates of perfume bottles to be coloured in based upon a persons particular feelings on any given day." 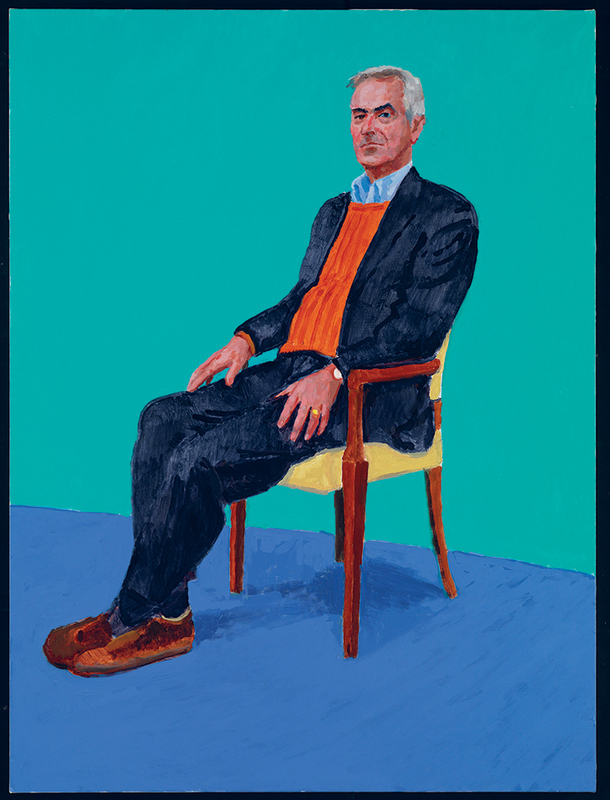 Last night I was lucky to get to see the new David Hockney show at Tate Britain. The exhibition is a survey of almost 60 years of Britain's most popular artist. I thought it was brilliant. I've always been a fan of the work he made in the 1960s when he was a student at the Royal College of Art. It was also good to revisit all his iconic swimming pool paintings, The double portraits and the collages of Polaroids still delight. There were of course dozens of great works I'd never seen before including two vibrant paintings of his garden in LA made in much more recent times. As you'd expect the Tate catalogue of the exhibition is well worth getting. 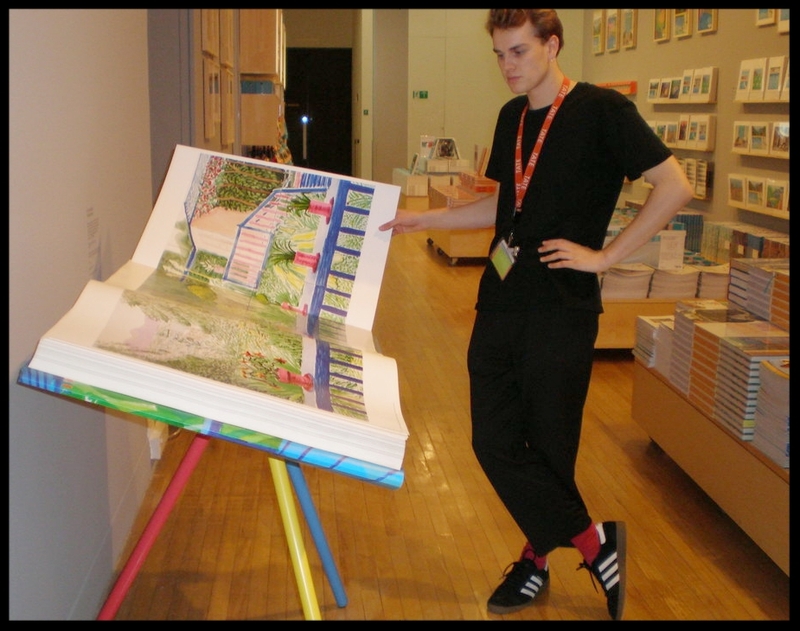 Younger Hockney fans will love Rose Blake's "Meet The Artist" and a few rich people will rush out and buy the limited edition Taschen SUMO sized monograph. 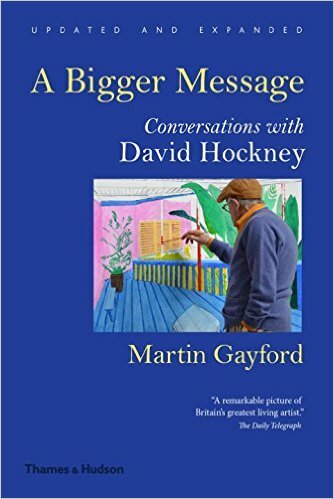 However, of all the books on Hockney available I personally get the most out of reading Hockney's conversations with Martin Gayford. 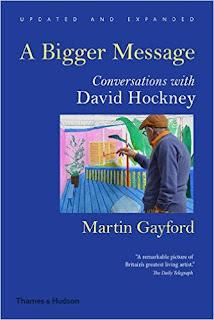 "Sparky, illuminating and entertaining – a decade’s worth of conversations between David Hockney and art critic Martin Gayford that explore via anecdote, reflection, passion and humour the very nature of creativity." 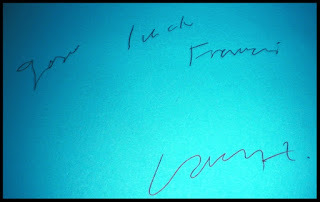 A few years back I swapped some emails with Mr Gayford about working with Hockney. Hope you enjoy the following funsize interview. 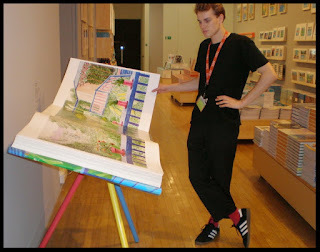 Me: Have you always been an admirer of Hockney's work, has there ever been a time when you couldn't connect with his art or get enthusiastic about his passions? Martin: "I suppose I experienced a slow process of getting to know his work and ideas better as I got to know him, starting in the early 1990s" Me: "How much control did he give you over the book? Did he insist on many changes and cuts?" Martin: "In a way, he gave total control. Naturally, I sent it to him when I'd finished. He said "I'll read it very carefully". At that point he could have asked to change this or that, but in the event he was happy with everything." Me: Have you ever had a heated conversation with him? If you thought his arguments on, (for example) smoking were full of holes would you confront him? 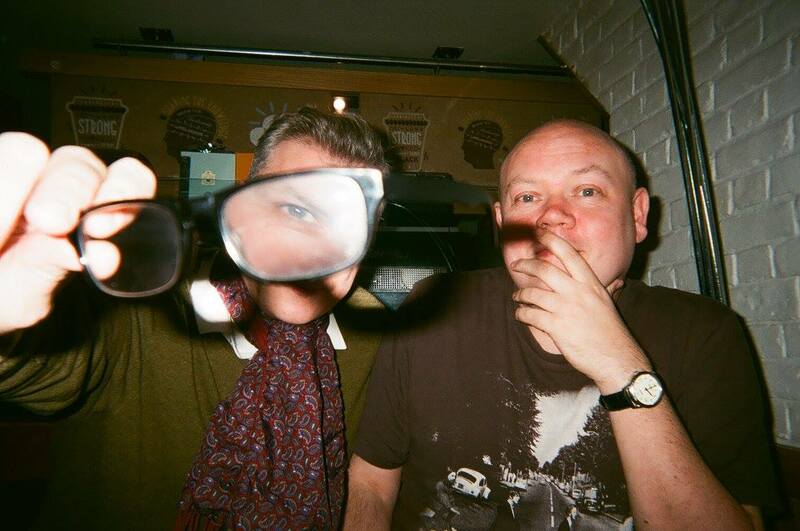 Martin: "We've never had a sharp disagreement, though he thinks I'm a bit eccentric I think in certain respects - travelling by train, not smoking. We tend to agree, at least about art and we're both a bit bohemian and libertarian." 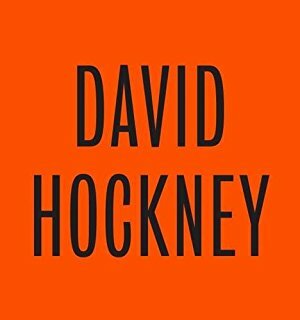 Me: Hockney has very strong links to great artists of the past such as Picasso. Various critics often say they feel that men of the moment such as Grayson Perry or Jeremy Deller aren't really artists. Would you agree that Hockney is the real deal whereas most Turner Prize winners will be forgotten about in a few years? Martin: "I think Hockney (and Lucian Freud, Frank Auerbach, Leon Kossoff and several other contemporary artists) are definitely the real deal. I find it hard generalise about Turner Prize winners. Several of them -Antony Gormley, for example, and Chris Ofili - I have a lot of time for, others much less." 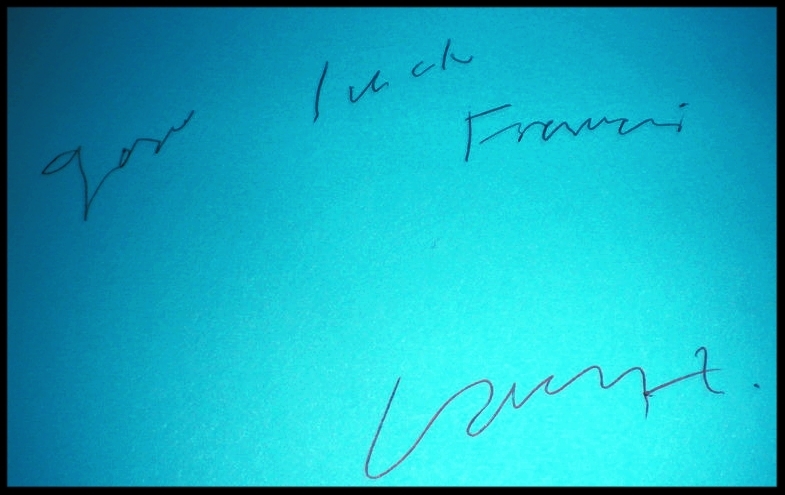 Me: "Of all your conversations with Hockney over the years which exchange, claim or observation took you by surprise?" Martin: "Hmm, perhaps when he told me about reading Proust for the first time, and having to look up asparagus. He'd never heard of it, they didn't have it in Bradford." 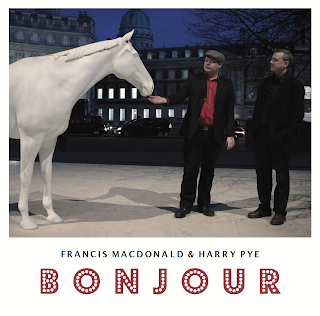 "Isle Of Capri" is a song from "Bonjour" - a new album by Francis Macdonald and Harry Pye. Francis Macdonald is a musician, producer and composer. (www.francismacdonald.com) Harry Pye is an artist, writer and director of The Mainstream Gallery. (www.harrypye.com) The album "Bonjour" will be released in Japan/Asia via Hostess - www.hostess.co.jp The album will then be released in the rest of the world by Shoeshine records. To whet your appetite, go on You Tube and search for "Francis Macdonald and Harry Pye Isle of Capri." Both photos of Francis & Harry were taken by Gordon Beswick. The album sleeve was designed by Tom Scott.